Baba Capra: who wouldn't be happy doing the neutron dance? A was once an apple pie before the pie making class. P was once a pumpkin pie after the class that was made from real pumpkin for a change because I didn't want to sacrifice another of my blue Hubbards, so you can see how much I care about my lady friends. Nothing fancy, just good traditional pies. I think my favorite was the apple pear cranberry, but I plan to make the coconut and banana cream pies too. Typically when I make pie I go for fruit of some kind, and besides, John the Communist doesn't like coconut (bad childhood). But next week is the pie superbowl, after all, and I've been asked to bring some pies, and I can bust out all over. I guess I've shown enough gumption to work my way up from janitor to salesman--last time they had me bring a green salad, which you know is for screwups that you're trying to help feel important (kidding, Sarah--artistic license). This is the kind of turkeys we have around here, and did you know they were introduced? Like our own version of the cane toad? I feel so dirty. But then I look at how beautiful the turkey is, and I tell it to sing, damn you, sing, and then I forget about it not being indigenous. I am going to kill some cats pretty soon. No, that does not look like the wild turkeys around here, which are abundant and hideous and off-limits and probably not introduced. 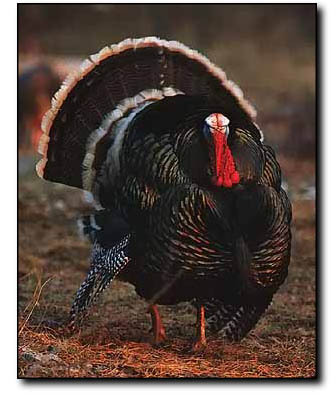 That is a gorgeous turkey.